Do you love spending your weekends with your son or buddies fishing at the lake? Are you looking for an affordable gadget that will reveal to you where the fish are? 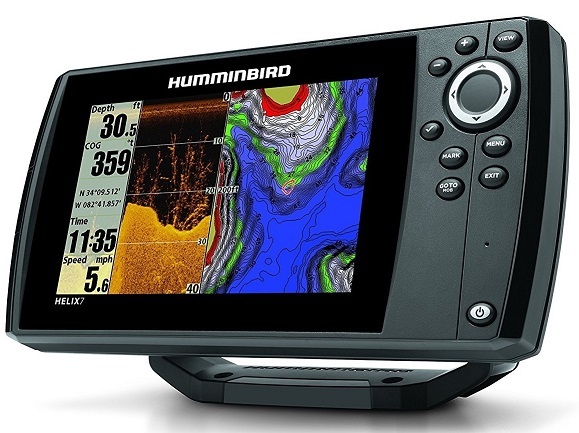 The Humminbird Helix 7 DI GPS is a top of the line model that is packed with advanced sonar and mapping technologies. It is easy to use and dependable under any circumstances. It is unbelievably clear and bright thanks to the jaw dropping 800 by 480 resolution and 1500 nit brightness. With the 16:9 aspect ratios, the Helix 7 DI GPS provides ample room for the user to view two screens side by side. Plus it makes fishing and navigation to be a lot easier. It comes with a built-in quick release gimbal mount which makes angle adjustments and removal to be easy. display. This offers maximum visibility in the sun. As an LED backlit display, the brightness offered is great which ensures readability of on-screen data. When fishing, chances are the weather will change. One may experience light showers. It is common for guys to carry with them waterproof rain jackets which help to keep them dry during light showers. This is not the same with many fish finders units. According to the review, the unit is produced with IPX7 waterproof level. This means that the device not only withstands light rain showers but it can withstand submergence in water up to a depth of 1 meter for 30 minutes. This is why it is highly advisable to keep the unit dry always. The unit comes with extra ram which complements the embedded processor. According to the product engineers, images do require a lot of computing power. Without the extra RAM, the images being processed would take time. Thanks to the extra RAM, users will experience higher sonar and mapping refresh rates. What this means is that images displayed will be updated quickly and users will not experience any lag time. Today, microSD cards have become very useful. Not only have they ensured that data is transferred from one medium to another but they also allow the storage of data too. 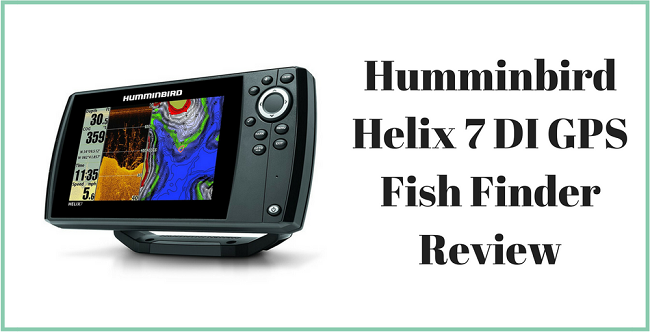 The unit comes with an extra single microSD card slot which allows the user not only to record and capture sonar images but one can upload new updates for the Helix 7 DI GPS. This ensures that the unit stays up to date and functions as needed. The unit has GPS capability which can store up to 2,500 way points and 45 routes. Each route can also store 50 way points. It has a track function that offers detailed position history. This consists of a breadcrumb trail points. Thanks to the GPS capability of the product, users can record clear current tracks at all times. It has 7 inch big color display that offers 800 by 480 resolution. This ensures clear images are displayed at all times. The LED display is backlit thus has sufficient brightness. ​It has GPS capability that not only allows one to use the mapping function but also contains 2,500 waypoints. ​It is highly portable and weighs only 5 pounds. ​It has an aspect ratio of 16:9. Although it offers a microSD port, you will have to interchange cards from time to time. What is the unit’s power source? Can you download maps and use them with the unit? Yes, you can download and store maps of your area in an SD card. This s a perfect fish finder for any user who is looking for a premium device. It has a 7 inch LED backlit display with a resolution of 800 by 400 pixels. It has an aspect ratio of 16:9 that ensures wide angle views during scanning. It has the Down Imaging Sonar which allows the user to see what’s underneath the boat. This allows the user to have a fish eye view of the underwater world. If you are looking for a feature rich unit that will provide great results, then I highly recommend you purchase it.